Open with Jonah, a man who is studying for everything when he suddenly freezes, unable to move except for a single tear trailing down his face. At the Annex it’s everyone’s day off but everyone is either so geeky or so dedicated they’re not actually going anywhere. Except Ezekiel who is using it as a safe spot to run from the police. They’re all doing their thing when the Clippings Book freaks out pointing to Major Magic Mojo at a STEM fair (a high school science fare) which excites Cassandra to a rather disturbing degree. Eve is less impressed. In between Eve not getting it and Cassandra geeking out quite adorably, Lucinda McCabe, whose company sponsors the fair would like to know who the hell they are and what the hell they’re doing there, albeit more politely. 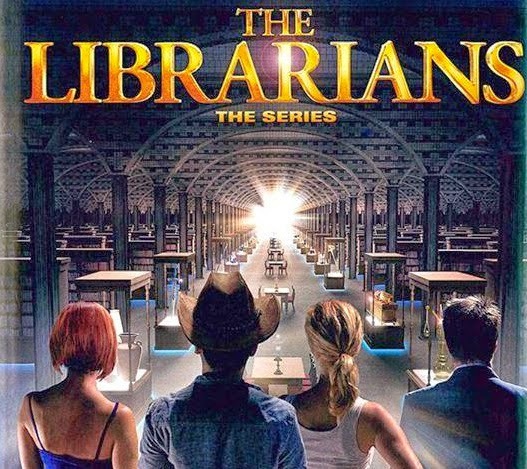 When Jake introduces them as The Librarians (because they don’t do cover stories) they’re taken to be judges. They search for something magical with Cassandra excited, Ezekiel bemused and Eve bored until she finds a baking soda volcano and is quite gleeful even while Jake points out it’s ridiculously simple and beneath every other amazing exhibit there. While Ezekiel and Cassandra discuss cliques, magic happens – from a floating Newton’s cradle to an actual erupting volcano. Lucinda rather nicely covers it up with extra Librarian cover story snark. Eve and Jake question the kid with the volcano (who is crushing heavily on Eve) and he reveals he wasn’t supposed to be there – he was the 5th alternate and only entered because his dad made him. All the previous kids before him all had super-rare, weird ailments that knocked them out. That leaves Ezekiel and Cassandra to investigate joined by Jenkins (the supreme god of awesome snark before which we all bow in worship) who snarks. Following Ezekiel’s hunch (and, as he points out, his own Librarian-ness) and track down the Newton’s cradle that floated. This time when they set the balls clacking, the force sends people to the floor. Jenkins points out that it’s just a detector and the laws of physics are probably being bent by a coven – and he raises the rule of three. Cassandra focuses on the clearly non-science kids lurking round the edges of the fare. Lucinda again does an awesome job of covering up another unfortunate incident. She’s good. Cassandra and Ezekiel asks Jenkins about the possibility of someone cursing the fare but he points out the rule of three means any magical harm caused will reflect back threefold, so someone has a huge backlash coming their way. He adds that even if they are amateurs there must be a magical focus out there. Jake decides to question awkward crushing kid to give a trite life lesson on who people are and who they pretend to be (relevant to Jake because he spends most of his life pretending not to be the artistic genius he is). Having earned his trust, Jake then gets a vast chunk of gossip about competitors in the fare which basically sums up as almost everyone hates Amy, the front runner. They go to question her which turns into actually questioning her uber pushy mother and Ezekiels uses a Jenkins device to identify and steal a mystical… mobile phone. A phone with a magic spell turned into an App. Jenkins and Ezekiel examine the app and it’s basically a “brain trainer” game that tricks the user to use magic and, at the end, make a wish. And it’s far too amazing for Amy to have created. So someone who subconscious wants to defeat their opponents ends up accidentally wishing harm on them (and getting woo-woo coming back). Ezekiel points out that it isn’t Amy who is using it. Cassandra lures Amy away so she can talk to her and tell her what’s happening – but Amy knows her mother gave her the Magic App which is why she didn’t use it. Her mother got it off a “pro-active parents” website and while Amy saw it granted everyone else’s wishes she didn’t want it because she isn’t focused on getting smarter, but on being “normal”. She didn’t want, as Cassandra finishes for her, to be the totality of her personality. She “wanted another adjective”, especially since her whole life is force, by her parents, to be all about academics. With the website they find who are the active users in the area – 27 (3 x 3 x 3 – lots of rule of three). Many of the kids are using it in an accidental “super-coven”. Which means the backlash is also growing into something really messy. Added distraction – Lucinda accidentally finds the annex and Jenkins calls Eve to deal with this sudden discovery. But they don’t have to worry about her learning their big secret because she’s not Lucinda McCray, she’s Morgan Le Fae. Jenkins fills Eve in on who Morgan Le Fae is (and she snarks – not as well as Jenkins but still – and she calls Jenkins Galeas – aka Galahad). Jenkins desperately urges Eve to shoot Morgan because she’s so incredibly evil but Eve only does so after she chokes Jenkins. But bullets don’t do much against a witch of that calibre. She’s happy to gloat to everyone her evilness – she isn’t even hurting people, that’s the fun part, she’s just putting magic in mortal hands and watching them destroy themselves. The rule of three kicks in – then she gets to skim off some of the huge magic generated to boost herself and keep herself eternally young (which suggests she’s been unleashing massacres like this for some time). She also vanishes. Everyone else helps put together the shield while Eve uses a stolen phone to make her own wish – an even playing field – and promptly punches Morgan in the face. Phenomenal cosmic powers, meet headbutt. But she can’t finish her off as the backlash brews the focus has to be saving the kids. Amy convinces everyone to gather in the centre of the room with a rather gloriously arrogant speech and the Librarians create their nifty 5 pointed shield. It works – it saves them – and plunges Eve and Morgan “between the seconds” a kind of shadowy, echoy half-world. Alone. She escapes and Eve is returned to the real world where everyone is saved. And the guy with the volcano wins the fare because they’re Librarians so why not. And Ezekiel steals the trophy for Cassandra because he’s him and it means something to her having lost her trophies. Jenkins, meanwhile, is furious that Eve didn’t kill Morgan Le Fae – losing 100 people for the sake of saving the thousands to come is worth it. Eve disagrees – she’s a Guardian not a hired gun. Eve recognises there’s a connection between Jenkins and her and passes on the note which he translates “do not fear the villain, fear the hero.” He adds his own message- an end is coming and she has to learn to fight the war rather than just win the battles. I kind of love how they don’t have cover stories, it’s such a wonderful lampoon of shows of this type where the heroes charge in with rather flimsy cover stories and never ever get properly questioned. I appreciate the subtle snark of it.